The mid-west Norfolk civil parish of Southacre is situated directly south of Castle Acre and West Acre. The word acre comes from the Old English for a plot of arable land. The parish has a long history, and was certainly well established by the time of the Norman Conquest, its population, land ownership and productive resources being detailed in the Domesday Book of 1086. The earliest datable evidence of human activity comes in the form of Palaeolithic flint tools, many of them found in gravel pits. This include a number of unspecified implements (NHER 4150), handaxes and flakes (NHER 4097, 4098, 4099, 15725 and 18198) and an exceptionally important Levallois flake (NHER 4099). A concentration of Mesolithic flakes, cores and axes (3890) found in the north of the parish suggest a flint-working site existed there in that period. Other Mesolithic flint finds include axeheads (NHER 4105, 13336, 13337 and 23092), a pick (NHER 13337) and microliths, core tools and blades (NHER 15724). A stone macehead (NHER 4113) found in the grounds of the Old Rectory (see below) could be Mesolithic or Neolithic. An unusually large number of Neolithic flint tools have been recovered, many again from gravel pits. Selected examples are axeheads (NHER 4106, 4107, 4148 and 14881), polished axeheads (NHER 4110, 4112, 4114 and 14481), scrapers (NHER 4101 and 14013), arrowheads (NHER 14881), blades (NHER 4112, 4149 and 4153), a pick (NHER 14014) and a polished knife (NHER 4105). Neolithic pottery fragments were found in the 1960s in the area of the probable Bronze Age barrow at NHER 3953. 1933 aerial photography revealed the cropmarks of five Bronze Age ring ditches (NHER 11971) west of Southacre village. By 1986, commercial gravel extraction had destroyed all but two, and these were excavated from 1987 to 1988. One was found to be a natural feature, but the other was considered to be the levelled remains of a large round barrow. Two pits within the ring ditch revealed no burials; one contained a number of Mesolithic flints, the other a fragment of Early Bronze Age pottery, possibly indicating the age of the former barrow. At a later date and over a period of time, over a hundred shallow graves were dug into the silted-up surrounding ditch. The graves contained the skeletons of men, women and children, placed or thrown in unceremoniously. Coupled with some evidence of decapitation and bound limbs, and a few finds of Saxon date, the bodies are thought to represent executed criminals of this period. Other probable Bronze Age ring ditches have been identified by aerial photograph analysis (NHER 3953, 18343, 20878 and 32248). Bronze Age finds to date include barbed and tanged flint arrowheads (NHER 3956, 4105, 4149 and 14881), pottery fragments (NHER 3953 and 14882) and copper alloy axeheads (NHER 3953, 4099, 4116, 15722 and 4115) and a spearhead (NHER 4117). Few Iron Age objects have been found to date, just some fragments of pottery at NHER 3953. An enamelled copper ornament (NHER 13194) found in 1954, possibly a harness mount, could be Iron Age, Roman or medieval in date. Roman finds are more plentiful and include coins, brooches, brick and tile fragments (NHER 3953), pottery fragments (NHER 3988, 4118, 4119 and 4122), a piece of puddingstone quern (NHER 4121) a bracelet (NHER 17690) and a decorated spoon (NHER 4123). Part of the Fen Causeway Roman road (NHER 2796) has been identified in the southwest of the parish. In Norfolk, the causeway runs between Upwell and Denver, but in places there is more than one possible route. Saxon finds are scarce, consisting of pottery fragments (NHER 3953), two brooches (NHER 3953 and 3957) and a bead (NHER 4106). The medieval period has left the parish with its earliest surviving building, St George’s Church (NHER 4126). This is an inviting building, whose small size is out of all proportion to the interest it contains. The oldest part is the nave, and inside it the massive, severe font, both of which are Norman. The chancel is 13th century. In about 1300, the north aisle running into the chancel was made into a chapel and the north and south doors added. After alterations in the 14th century, further extensive work took place in the 15th and 16th centuries, during which time the west tower was rebuilt by the Harsick family, whose coat of arms is set over the elegant west door. Over the same period, the north porch was added, the nave and chancel heightened and new windows and roofs put in place. Unusually, the church seems largely to have escaped restoration in the 19th century. Inside is far too much of interest to document in a summary. However a selected few items may whet the appetite. The tower screen was made up in the 19th century from pieces of the ornate 14th century rood screen. The Norman font has a restored 16th century cover with an inscription commemorating Geoffrey Baker, a rector, who died in 1534. There are a number of interesting coffin slabs, including in the aisle a tomb with the figure of a Crusader Knight on it, believed to be of Sir Eudo Harsick, a 12th century crusader There is an exceptionally fine life-size brass of 1384 to Sir John Harsick and his wife who are portrayed holding hands, a brass to Thomas Leman of 1534 and scanty remains of an armorial brass of 1454 to Sir Roger Harsick. 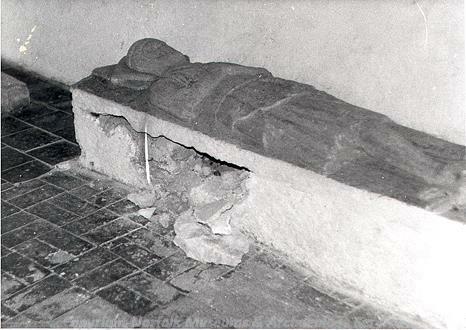 In the chancel is a low tomb recess, in which lies a strange, defaced and decayed wooden effigy, probably a 14th century member of the Harsick family. In the chapel is a magnificent alabaster and marble monument of 1623 to Sir Edward Barkham and his wife. Their recumbent figures lie on the tomb. He holds a book and is wearing over his armour the fur-lined robe and chain of office as Lord Mayor of London. On either side of a gruesome panel of broken skulls and bones are the kneeling figures of two sons and three daughters. Fine contemporary iron railings block off the chapel from the aisle. In the churchyard are the remains of a medieval stone cross, consisting of the base of an octagonal shaft on an ornate but weathered base. Other medieval structures have not survived, but have left fragmentary ruins and their surrounding moats. Old Hall moated site (NHER 4160) has two adjacent but distinct medieval moated enclosures, believed to be the site of South Acre manor, held by the Harsick family from the 12th century until 1454. The enclosures are situated south of the River Nar, north of which is the precinct of Castle Acre Priory (NHER 4096), of which the Harsicks were benefactors. Both the moated sites contain the visible remains of substantial masonry structures, believed to be at least two successive manor houses and ancillary buildings. The remains of a rectangular building between the moated sites are thought to be a free chapel founded by the Harsicks for their private use. Further medieval buildings have vanished entirely and are only known from old documentary sources. A 12th century leper hospital and church (NHER 4124 and 4128) stood on Bartholomew’s Hills, but no trace of them remains today, although human bones are said to have been found in the area. Documentary sources refer to large fairs being held here too (NHER 4159). Of the surviving post medieval buildings, Southacre Hall (NHER 4163) is probably the oldest in origin, a late 16th century and later two storey timber framed farmhouse, faced with flint and brick. The earliest parts are to the south and west, where fragments of the timber frame survive. The northern additions are 18th to 20th century. The fine chimney stack has four octagonal shafts. In the grounds is an ice-house (NHER 4164). Set opposite the church and with splendid views of the ruins of Castle Acre Priory (NHER 4096), the Old Rectory (NHER 21996) is a late 18th century and later former rectory of brick flint and stone, some of which is re-used medieval material. The two storey south front has three window bays with two full-height bow windows separated by a door and doorcase of Roman Doric columns under a broken pediment. The east bay and return were added in 1841. Inside is an original swept staircase with a mahogany handrail. On Bartholomew’s Hills stood an inn of about 1700 (NHER 4158), apparently notorious for highwaymen. The most historically recent entry on the record is a World War Two decoy airfield (NHER 29538) in the south of the parish, designed to divert enemy bombers away from the real airfield at Marham. It was a 'Q' type decoy, for night-time use, and had mock runway lights. The site's bunker still remains.